The key point of the composite bow isn't that the sinew and horn have a higher elastic modulus than wood (sinew has a much lower elastic modulus than wood, and horn is about double that of, say, yew), but that they can survive much larger strains. The sinew backing is pre-strained by the shrinkage as the backing dries, and when the bow is strung, it's even more pre-strained (just compare the unstrung reflexed shape with the strung shape). The horn is pre-strained when the bow is strung, but the same applies to a wooden self-bow. Both the horn and sinew will withstand much higher strains than wood. The importance of maximum strain versus elastic modulus is clear when you look at what makes good bow woods. Plenty of woods have much higher elastic moduli than yew (e.g., double), but yew copes better with strain. What might we be missing with steel prods? Are they reflexed? If not, why not? I don't recall seeing an old unstrung steel prod, or contemporary artwork of one. A lot of reflex will give a lot more stored energy for the same draw weight and draw length. Yes, I am aware that the modulus of elasticity is not the only thing that counts in a composite. I was more concerned with the fact that if that doesn’t change from steel to steel, then you probably wouldn’t get the compression/tension resistance differences between hard and soft steel either. That might make differential treatment of steel in a prod an unnecessary complication. Unfortunately, if you do a google seach, there are many crossbows that are either unstrung or whose string has gone slack. There is no evidence that the bows were recurved as far as I can see. If their tradition is old and reliable, those things were bigger than typical Western reconstructions I have seen. 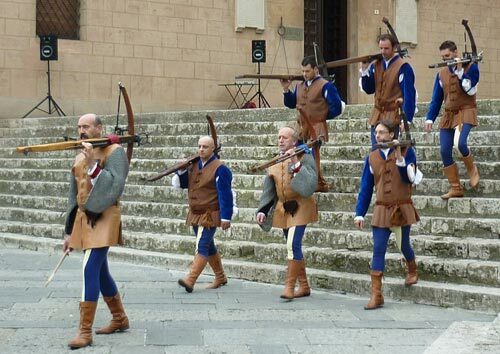 It might also explain something that struck me as odd: the fact that – so I have read - many Italian crossbowmen kept their pavise bearers as separate troop units, whereas Western Europeans depict their crossbowmen apparently carrying all of it themselves. You wouldn’t want to be doubly burdened with a shield and a crossbow as big as those Italian ones. I wonder (and have long wondered) how those weapons they use in the Italian festivals perform. Does anyone know? That's quite a velocity at 57 m/s. Looks like it gave quite a punch too. Look carefully at the crossbows used wit the windlass - especially clear at 1:20 (although there is another one of similar dimensions at the beginning) and also take note of the apparent size of the bolds in the quivers. It could be just me, but that looks like a weapon with an awful lot longer power stroke than six inches and with much longer bolts to match. As I said before, I suspect we are reproducing just one strand or subset of crossbow. The Italian ones which the Genoese were famous for may very well have been bigger than the norm, and the English/Germanic/French ones may have been lighter for mobility or whatever reason. It seems superfluous and too obvious to add that the variety of different bows and bow dimensions in that clip is impressive. WE just aren't reproducing that degree of variation - yet. Here is another test with another 579 kg draw (1280 lbs) composite-prod crossbow, 150 cm prod length, where shooting some very heavy bolts they got 57.7 fps with a 260 gram bolt for 433 joules (see 01:26), and 348 gram bolt for 488 joules (01:33). He's saying that weapon has a 'potential energy of over 1200 joules, though I don't know what that is based on. I don't think even this guy has quite figured it all out yet but he is clearly much closer to the reported medieval performance than in some of the older tests I've seen with composite prods where the prods seemed to fail after just a few shots and they had very poor performance. Maybe some of our German speakers on the thread could find out more about this test. Ok I'll try to prime the pump. the beginning of the video shows an antique pavise with some damage from crossbow bolt heads, then they show some examples of how the replica was made in various layers of I am not sure what, then they shot it twice and compared the damage to the original. Again by comparison a very powerful (144 lbs draw) English longbow reaches 160 joules so this is giving us performance clearly superior to the longbow (or most modern crossbow replicas) and a bit closer to what we would expect based on period sources or the famous Payne -Gallwey test. The huge hield is fascinating too. All this sinew glue, chalk, bone meal, seem to explain why it was the painter who was commissioned with making 100-some pavises in one Polish source (would have to dig it up). These horn and sinew bows are extraordinary and the work that goes into them can only commend the craftsmanship and dedication of the maker - hats off. It is also very interesting to get some proper numbers out and impressive ones too. I am really conflicted about the work I do with steel bows, because they don't seem to work as well as period sources suggest they should, however after 15 years of messing about with them I cannot see where I am going particularly wrong and so far nor can anyone else (please let me know if you can see significant errors in what I do). I do however remain a little disappointed with what they do, but am left with the conclusion that what I want and what was, are two different things. I would accept that my bows will simply not be as good as the originals, when a craftsman has learned right through apprenticeship to being an experienced master, his work will be better than mine - fact. However I will accept that my work may be 10%, 20%, 30% poorer performing, but not 50%. Payne Gallwey shot a 1200lbs steel bow 440Yds or 460yds or whatever it was. Really? Really did he? The best of the modern composite compound crossbows won't do this. I strongly suspect that like all Victorian authors he had his own agenda, his own sensationalisation's; all the arms and armour books of the late 1800's are of questionable veracity, should his book be treated any differently. The Payne Gallwey test was with a steel crossbow and this video test is with a composite and the two are vastly different beasts and cannot really be compared as like for like although they were contemporaneous. Let me be clear. You know more about the technical details of making a crossbow - or any pre-industrial weapon or artifact, than I will ever know. I have long been an admirer or your work and I think you produce beautiful stuff. My own extremely limited blacksmithing experience consists of making a home-made forge out of a brake drum and a hair dryer with one of my old punk rock buddies and very laboriously forging a couple of small knives out of railroad spikes. I only did that because it was fun and to help me gain some insight into what it all means, but I'll never be selling the kind of superb artifacts that you routinely produce. So I want to stipulate, what you have accomplished and learned, and to a large extent shared with the community is highly valued certainly by me and everyone familiar with your work, so far as I know. I have spent my own time involved in what we might call very broadly the "historical martial arts community"* basically trying to figure out the context of the fencing manuals from the 15th and 16th Centuries. I've tried to read everything I can get my hands on in terms of primary sources and scholarly analysis on that period. In that process I have learned a little bit about warfare in the period. This was certainly the case in the HEMA / WMA revival that went on for the last 20 years - it wasn't until dozens of different groups and individuals from many different parts of the world started to compare and test each others research that we really made any progress. I believe (just as an outside observer and small scale 'consumer') that we kind of went through a similar process in trying to create really good replica swords. And perhaps more pertinent - the really nicely performing weapons came along after guys like Peter Johnsson were going out and measuring antiques milimeter by milimeter. The quality of a high end replica European sword that you can get today is (in my opinion) far superior -including in terms of performance such as in handling and cutting- to what you could get in say 1995 or 2000. Also similarly for the fencing swords we use in HEMA. In both cases (real sharps and HEMA fencing swords) getting where we are today was the result of a large community of "consumers" who bought and used and tested the weapons, and independent researchers, and academics, and artisans, linked together in feedback loops which went through many, many, many iterations. 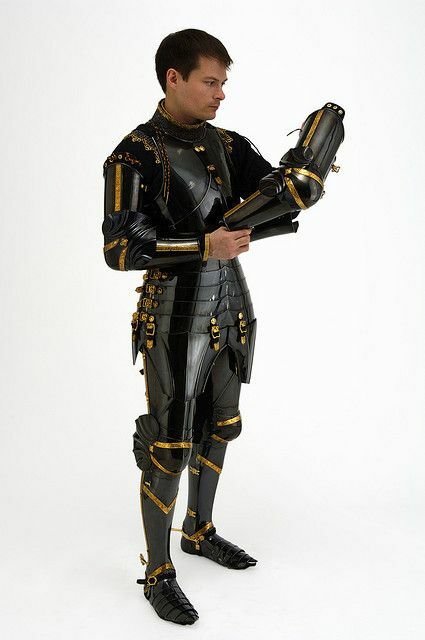 While I'm not even a consumer of armor, it being a bit pricey for me, I believe armor replica makers have vastly improved their techniques in the last 20 or so years. This would include especially improving their heat treatments but also in many other areas. ... I think it represents something which is closer to top level armor from say, the 15th or 16th Century than what was available 20 years back. I think we have gone through something somewhat similar with English warbows, groups such as the English Warbow society and in conjunction with their ongoing research and evolving sport, from affiliated artisans and traditional bowyers we have now excellent longbows available and we are starting to see archers reaching similar skill levels to what has been reported historically. We have also seen similar excellent revivals with recurve / composite bows (and specifically horse archery from guys like Lajos Kassai being famously at the forefront of this) - but obviously a host of skilled artisans can take the credit for producing the weapons. Finally I think we also have seen a similar progression with medieval hand-culverines, hand-gonnes, and other firearms. (on a much smaller scale) . What we know about their performance today makes them look much more formidable than what we thought they were all about 20 or 30 years ago. With crossbows we have a couple of problems. Not that many people shoot high-end historical replica crossbows. When shooting at static targets, a bow of moderate power is just fine, in fact a very powerful crossbow such as one of the ones in the last two videos I posted, would require a special type of range for safety. Very powerful crossbows are also tricky to span and take longer between shots. And as I have learned from some of your videos, aside from the risk of a prod breaking catastrophically, there are also factors like noise to consider. So far as I know, there isn't (yet) an English Warbow society type of organization for traditional crossbow shooting - at least not one that really has a need for weapons that can shoot 400 meters. There is still a living culture of crossbow shooting in Central Europe and in Italy, but I know in Italy for example they have quite consciously focused on safety in restricting the power of the weapons they use for their annual shooting contests. Today we don't have thousands of people fighting in wars with crossbows or hunting from horsback with 1200 lb draw arbalests to give us constant feedback (and pressure) to improve the weapons. Maybe we need to invent a new sport which really requires such a powerful weapon! And you may disagree but in my opinion Ralph Payne Gallwey's famous experiment is in synch with what I read about crossbows in medieval chronicles, kriegsbucher (German war manuals), autobiographies and letters, contemporaneous accounts of battles and armies from sources as diverse as Aneo Piccolomini, Jan Dlugosz and Gotz von Berlichingen, and perhaps most relevant in terms of technical specifications, the records of the shooting contests held by the dozens of Free Cities and City States in say the 14th,15th and 16th Centuries. These as you probably know typically included a full size example of the target that would be shot at, the range to the target in feet and an actual physical measurement of what that town considered a 'foot' measured out on the invitation. These describe performance similar to what Gallwey described. I also don't know of any sources indicating that the composite or horn prod weapons were more powerful or harder-hitting than the steel prod weapons. Do you? Over the last 20 years when it comes to historical fencing, there were many things in the manuals including both images and descriptions, that we originally thought were mistakes in the sources because we couldn't understand them, it was tempting to dismiss the sources. But later we figured them out. As a result I have come to tend to trust the sources, perhaps to a fault. You are certainly correct that the Victorians had their agendas and often distorted history, and we can't take everything written down in the 15th Century at face value either. But there enough of a wide variety of Late Medieval and Early Modern sources on the performance of these weapons (including from outside of Europe) that I'm confident that what they were describing was real. I believe we will continue to see improvements in these replicas and I believe we will find steel prod weapons, perhaps yours, that perform as we are told that the antiques did. The fact that we are starting to see some horn prod weapons getting into the ball park is very encouraging to me. * very broadly including collectors, smiths, artisans and fabricators, re-enactors, historical fencers, acaedmics and so on... this website being one of the meeting places for people from the many different wings of this overall "thing". If we assume that Gallwey was being truthful about his measurements, it's also worth keeping in mind that his 18 lb siege crossbow probably wasn't a typical example. He claims to have the chance to try shooting a number of other 15th century crossbows, the farthest of which only shot a slightly-more-reasonable 380-390 yards. And even then he doesn't list how far each of his other examples shot. So that could mean anywhere from "one crossbow shot 390 yards while the rest shot around 370 yards" to "one crossbow shot 390 yards while the rest shot less than 200-300 yards but I decided to ignore those." Additionally, even with their extremely impressive power and performance it perhaps can't be taken for granted that Gallway's examples would have been actually considered "battlefield weapons." Peak performance isn't everything when it comes to military use, and crossbows can be pretty dangerous if that 1200 lb bow suddenly snaps after a soldier is done dragging it through mountains, forests, and trenches. ". . . yet when they shall be brought to their liverie bows, which are rather made to indure weather, then for free shooting, their arrowes likewise big timbered, their fethers ruffled, whereby they will gather winde, and ordinarily made of such length, that very few will draw them to the heads two three inches, these things considered, if tenne amongst a hundred do shoote above tenne score, all the rest will shoote short of nine." I guess what I'm saying is that your best crossbows seem to be already outperforming what was considered typical of a military-grade longbow in the mid-late 16th century. Perhaps the Payne-Gallway numbers were the kind of thing that would only be achieved by a master craftsman who decided to see what he could do if he threw safety out the window, designed a crossbow with a much lighter string and a much lighter bow near the tips, put as much strain on the remaining steel as he possibly could without it breaking, then hired an assistant to do the test shooting for him just in case it did break. All of that would be very interesting if there was any evidence to support it, but to the contrary, the literary evidence tends to support that at least the larger and more powerful crossbows (sometimes referred to as 'wall crossbows') did indeed perform as Gallway described. Given the performance indicated by the crossbows in the last two tests I posted in this thread, 69 m/s with the relatively small 1200 lb draw cranequin spanned crossbow shooting an 81 gram (2.8 ounce) bolt, and 52-57m/s with the larger 1298 lb draw, 23 lb siege crossbow shooting much larger 260 gram (9 ounce) bolts are probably approaching the power of the better weapons Gallwey tested (~200 joules for the lighter weapon and 433 to 488 joules for the siege crossbow), I don't think we have any reason to make up theories about outliers. Performance of crossbows in the field in military circumstances and in hunting, as well as in more casual sport contexts (schutzenfest etc.) were well known quantities by the 15th Century. It did take a trained marksman to handle such powerful and potentially dangerous weapons (contrary to the Trope so often cited when comparing crossbows to longbows) but the same could also be said for the firearms of the time, which we also now know to be far more effective than once thought. The huge shield is fascinating too. I thought it was fascinating as well and I think was the main thing they were actually testing there. I've been wondering about those pavises for quite some time, do you know what the various layers of laminate it was made of? It looked almost like cement but I know that wasn't it! You said chalk and bone meal? I also noticed something that looked like small pieces of hide or ...horn? I'm pretty sure there's plenty of evidence that less impressive crossbows saw use in battle as well. There were the Geonese crossbowmen who decided to close to within longbow range at the battle of Crecy. Descriptions of crossbow volleys sometimes doing about as much damage as a shower of rotten apples. Sometimes crossbows are mentioned penetrating armor but other times sources will say that a person was killed because he lifted his visor at the wrong time or the bolt found a gap in his armor. Yes the more impressive crossbows saw use in battle as well but I think the question should probably be something more like "In a late medieval army what % of crossbows would have typically been more on par with great siege crossbows, wall crossbows, etc. as opposed to less expensive rotten apple crossbows or something inbetween?" I think you are tripping over two things here. First of all, you are trying to talk about "medieval Europe" as a general thing when it's actually quite problematic to generalize about it. Both in time in space you really have to distinguish where you mean, even though it is a nuisance and seems kind of pedantic. The reason this is important in the context of medieval weaponry is that the culture of marksmanship was not evenly distributed throughout Europe. To that point, there is a reason why the French tended to have to rely on mercenaries from Genoa (or Switzerland or many other places), and why they had so many problems integrating their cavalry with their marksmen and with their infantry in general. Reasons of social and political organization as much as military strategy. I.e. they did not have a strong tradition of using crossbows in France, and French armies favored their cavalry to such an extent that while they won many battles, their contempt for commoners in general and infantry specifically often caused them to suffer catastrophic defeats, not just against the English as we so famously know, but in Spain, in Turkey, in the Holy Land. The impetuous cavalry charge resulting in death and mayhem for the aristocratic cavalry itself was something that plagued the French throughout later medieval history. There are three aspects relevant to the performance of crossbows on the battlefield, one is weather, the other is the types of crossbows, i..e. the hardware, and the third is the culture of marksmanship. The latter was cultivated in certain specific parts of Europe which are also among the least well known in the Anglophone world, even among people who ostensibly have an intense interest in medieval warfare and martial arts. These are the same places which were the earliest epicenters of the Renaissance culture and the source of most of the cultural, technical, and military innovations of the later medieval era (high and late medieval). Namely the city-states of Northern Italy* , the Free cities of the Rhineland and Southern Germany, the Free Cities of Flanders and the Low Countries*** and those of the Hanseatic North****, and a few other scattered zones around Central and Southern Europe*****. Those places sponsored a highly elevated culture of crossbow marksmanship through the development of shooting guilds and the establishment of traditions such as the Schützenfest and the equivalent practices in Italy, which are still conducted almost exactly as they were 500 years ago, partly for tourists but largely for the benefit of the burghers themselves. To quote the Wikipedia article on the Schutzenfest, " However, the self-confident spirit of the townsfolk that marked these festivities was not always regarded positively by the authorities. For this reason, different traditions developed in different regions." Here you can certainly think of France and to some extent England and the major Spanish kingdoms like Castille, though England eventually cultivated longbow archery among their rural gentry and yeoman peasants as a carefully managed alternative. This is one of the major points of confusion about crossbows. Both modern observers and many period documents tend to refer to crossbows by the same terms or euphemisms. This is particularly true in places like England and France where they were not very invested in crossbow marksmanship as such. But there were very important distinctions. Light wooden prod crossbows (sometimes referred to as knottelarmbrüste in German records). These were made with a thick yew prod and could be spanned with the help of a strap and / or a belt-hook. They were assigned to low-skilled warriors such as non-citizen townfolk or peasant levies. Medium power stirrup crossbows (sometimes referred to as steigbügelarmbrust in German records). These were usually steel but sometimes composite prod weapons, featuring a foot stirrup to aid in spanning though they were also spanned using lever-like devices such as the wippe and the goats foot, or for the more powerful . These had an effective range of about 200 meters for area shots and 80 meters for direct shots at individual targets. A draw weight in the 400-800 lb range, they were used for hunting or military purposes and sometimes by cavalry. Cranequin arbalests (sometimes referred to by the Teutonic Knights as halb rusting "half ton" - I think this is Low German, or as stachel "stinger"). This would be the type you see in the most recent video I posted in this thread. Could be either steel or composite. In the range of 800-1400 lb draw. Effective range up to 400 meters for area shooting, to individual targets 150 -200 meters. These would most typically be spanned using the cranequin. These would only be issued to or used by elite troops, especially members of the crossbow societies. The weapons were expensive as were the spanners. They were used both by cavalry and infantry. Siege crossbows (sometimes called 'wall crossbows' or sometimes "english winders") these are the really big siege weapons such as the one in the second to last video. Not really suitable for the open field unless for example protected by a war wagon or a ship, boat or raft. These had the longest range and the hardest impact. Usually spanned with a windlass. Slurring together all three of these types of weapons and a wide variety of marskmen ranging from peasant levies to champion experts from elite shooting guilds contributes to the mass confusion on this topic. ***** Prussia, Catalonia, the Dalmatian Coast, Bohemia, Livonia, Silesia, etc. That's true, the specific preferences, training, and technology available would have varied based on the exact region and period. What I was trying to get at though is that even for an elite crossbowman there wouldn't have been just one "best" crossbow for every situation. Different properties would likely be preferred by a soldier garrisoned in a nice, warm castle vs one out trudging through the mud, or a crossbowman who finds himself most often targeting lightly armored skirmishers and horses instead of heavily armored footmen, or by a crossbowman who spends a lot of time skirmishing in wooded areas where he can rarely see more than 50 yards anyways as opposed to in open plains. And that's not to mention any expert marksmen who decided to come armed as mounted crossbowmen instead in order to earn higher pay. This is a really big issue with early firearms as well, where late medieval writers rarely even distinguish between artillery and handguns, never mind different types of handguns. Yet 1462 legislation in Nuremberg still lists 5 different standardized handgun calibers: 75 g, 35 g, 25 g, 21.25 g, and 12.5 g.
Remember that crossbows also varied by period, & that different sources paint divergent pictures. For example, in El Victorial (see one English translation here or pick up a Spanish copy), describing events of the early 15th century, spanning crossbows by the belt/girdle (cinto) appears not as something for mere peasant levies, but rather as the best method to span a mighty crossbow. And these crossbows don't seem inferior to the English bow in the account of conflict between English archers & French/Spanish crossbowers. Folks these days tend to focus on crossbows spanned by cranequin or windlass, but that wasn't necessarily the most militarily important type, at least not as late as the early 15th century. Various mechanical spanners saw use before then, but did not outcompete other spanning methods. As another data point, in a work published in the early 16th century but probably written in the 1480s, Pietro Monte considered crossbows potentially dangerous to a soldier in white harness, akin to a strike from a lance. & that's far from the only source from this period attesting to the power of at least certain crossbow designs. Monte notably lived during what I'd call the zenith of European performance. Into the early 16th century, elite troops used crossbows, such as the mounted crossbowers in considerable armor that were popular in France, Germany, & Italy. The weight of the period evidence I'm familiar with indicates that crossbows spanned by the belt or whatnot should hit at least as hard as English warbows, assuming similar strength of the shooter, while the ones spanned with a cranequin or windlass should genuinely threaten to penetrate thin or lower-quality plate armor. Even the nearly 200 J from that 1,200lb composite crossbow doesn't seem like quite enough to worry someone in a late-15th-century white harness based on the numbers from The Knight and the Blast Furnace, though it might punch through a thinner breastplate with a perpendicular hit at close range. It might inflict a serious wound through 1.5mm of hardened steel & padding with a perpendicular hit, which is pretty impressive. So I tend to agree with Jean here, while acknowledging I don't really know. I suspect the best historical crossbows were rather more powerful than current replicas.